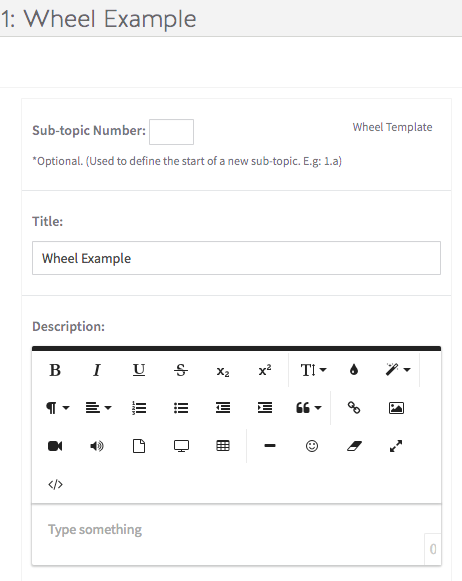 The Wheel Template provides a fun and engaging way to introduce new glossary terms, ideas, or concepts in bite size pieces. 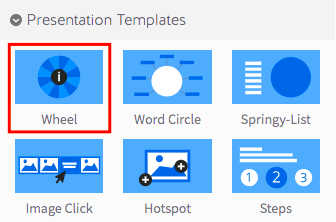 Step 1: Select the Wheel Template from the Presentation panel. Step 2: Drag your Wheel Template into the Lesson Pathway. Step 4: Click the yellow Edit Tile button. Step 6: Now select an icon to display in the centre of your interactive wheel. A number of useful icons are available, including a generic ‘information’ symbol. Step 7: When you’re done, select ‘Save’. Step 8: To start building your Wheel, select the green Add New Item button. Step 9: The Creating New Slice box will pop up in your edit screen. From here, you can add a title (which will be displayed within the wheel), pick a colour for the segment, and add a description, which will be displayed when the label is selected. If you need more room for your text, you can easily add additional screens using the ‘Pagination’ button that we reviewed earlier. Step 10: When you’re done adding text, select the green checkmark to save your changes. Note: To add additional wheel segments, simply repeat the process. Note that you’ll need a minimum of 4 items to create a wheel presentation – the maximum number of segments allowed is 12. You can re-order each item by using the ‘drag and drop’ handles on the left. The order they’re displayed in here is the order that will be displayed to Participants. Step 11: To preview your interactive wheel, click on the ‘preview’ icon. This template (and all other Presentation Templates) will adapt to fit your screen size for any device. While the wheel isn’t visible in this view, all of the content remains exactly the same and is much easier to navigate with limited screen real estate.